The Space Potatoes, a rocketry team from Odle Middle School in Bellvue, Washington, took first place at the International Rocketry Competition in London on July 15, 2016. Space Potatoes win! 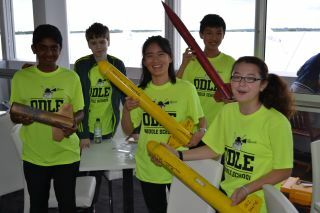 The Bellvue, Washington-based Odle Middle School rocketry team took first place in the International Rocketry Challenge July 15, precisely launching a rocket and landing its precious cargo: two raw eggs. The team defeated 789 U.S. teams over the course of the 2016 Team America Rocketry Challenge, and defeated one team each from the United Kingdom, France and Japan to take the international title, which is open to 7th through 12th graders — the Space Potatoes are in eighth grade. This is the second year in a row that a U.S. team has won. "Representing the entire country was really intimidating," Mikaela Ikeda, the Space Potatoes' 12-year-old team captain, said in a statement. "Luckily, we had each other for support and everyone did their jobs perfectly!" : Liftoff! The Space Potatoes rocket takes flight at the Farnborough International Airshow. The Bellvue, Washington, team took first place at the 2016 International Rocketry Challenge July 15. The team's rocket had to reach an altitude of exactly 850 feet and return the two raw eggs, placed perpendicularly to each other, to the ground unharmed, flying for 44 to 46 seconds. They also had to present for a panel of expert judges and "defend their knowledge of rocketry physics and explain their decision-making process for this year's competition," Team America Rocketry Challenge said in a Facebook post. That portion was worth 40 percent of their score. "London is a new place and [we had] never flown in their conditions," team member Larry Jing, age 13, said in the statement. "But we haven't broken a single egg in any of our rocket launches." The contest was hosted at the site of the 2016 Farnborough International Airshow, and the team's trip from the U.S. to the global competition was sponsored by Raytheon. The middle schoolers named their team in honor of the novel "The Martian," that was recently made into a movie, where the protagonist survives being stranded on the Red Planet by growing potatoes.